This odd couple photo was captured in the eastern Mediterranean Sea on November 24, 2011, at about 4:00 p.m. The weather at the time of the photo seemed quite benign; calm seas, rather light westerly winds, fairly high barometric pressure (30.03 in or 1017.3 mb), air temperature of 78 F (25.5 C). I was aboard the Dutch container vessel, Maersk Kalmar, of which I'm captain, and was surprised to see a rainbow and waterspout in such close proximity to one another. I estimated the spout to be approximately 1,000 ft (304 m) from my position. 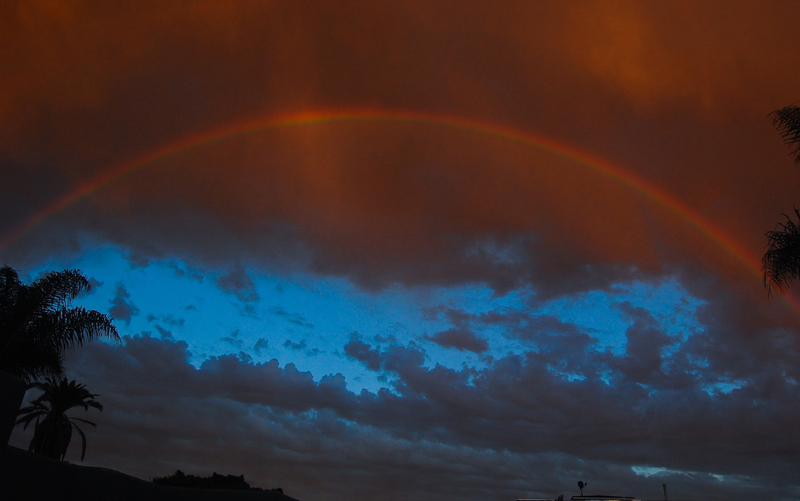 We're accustomed to seeing rainbows when the weather is improving -- when storms depart. This is because in the zone of the westerlies, following an afternoon storm or rain shower, the Sun is in the west and a rainbow, if visible, stretches across the eastern sky. 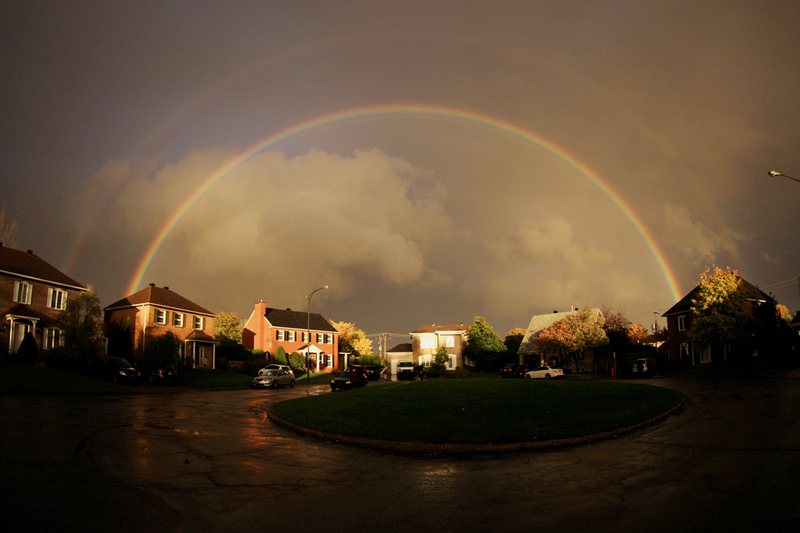 However, as long as the Sun is shining, there are raindrops falling in the antisolar direction, and the Sun is lower than half way up the sky (no more than 43 degrees above the horizon), it's possible to see rainbows. This is so regardless of the season, the compass direction or whether or not a tornado or waterspout is in the vicinity. Waterspouts generally occur in the tropics or in the lower mid-latitudes during the warmest months of the year. As with a tornado, a rotating column of air dangles from a cumuliform parent cloud, but waterspouts, like the one pictured above (south of Crete, Greece), are neither associated with severe weather nor thunderstorms. Nonetheless, they can cause damage to small boats but most often dissipate when arriving onshore. I actually witnessed three different waterspouts this afternoon -- the one shown above being the most noteworthy.